We know that the pH of skin is around 5.4. The makers of Finacea, Intendis have formulated Finacea to be pH of 4.8, which means that Finacea is reasonably close to the same pH as skin. One of the ingredients of Finacea is sodium hyroxide, which is alkaline, so can be used to adjust the pH of the final formulation. By comparison, Metrogel Vaginal has a pH of about 4.0, I was unable to find the pH for Metrogel 1%. The following research found that an azelaic formulation of pH 4.9 was substantially more effective at delivering the active agent (azelaic acid) to the dermis and epidermis, compared to a pH 3.9 formulation. Intendis tell us that Finacea has pH-adjusted to around 4.8 and thus Finacea shows "No interference with physiologic pH of skin acid mantle. Optimum pH for formulation consistency". Drug Dev Ind Pharm. 2011 Nov 23, Li N, Wu X, Jia W, Zhang MC, Tan F, Zhang J.
Tianjin Key Laboratory of Drug Delivery & High-Efficiency, School of Pharmaceutical Science and Technology, Tianjin University , Tianjin, PR China. Objective: The aim of this study is to investigate the effect of ionization and vehicle of topical formulations on skin absorption and penetration of azelaic acid (AZA). Materials and methods: In vitro transport of AZA was determined for two topical formulations containing AZA with pH values of 3.9 and 4.9, respectively. 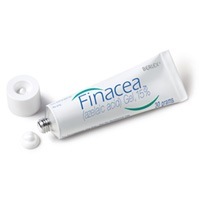 FINACEA(®) (15% AZA gel), a US Food and Drug Administration approved drug for treatment of acne and rosacea, was also used for comparison. Release profile and flux of AZA were determined in an in vitro hairless mouse skin model using Franz Diffusion Cell. Results: The data have shown that a higher concentration of AZA is retained in the epidermis/dermis layer and the whole skin for the formulation with pH = 4.9 as compared to that with pH = 3.9 at an active loading level of 2.82 mg/cm(2). In addition, the flux of ionized species of AZA in the pH 4.9 formulation (128.4 ± 35.9 μg/cm(2)/h) is approximately five-fold greater than that in the pH 3.9 formulation (27.7 ± 4.0 μg/cm(2)/h). The results suggest that the ionized AZA penetrates through the skin and accounts for majority of the total flux. Discussion and conclusion: This study has demonstrated that the penetration and absorption of AZA show a strong pH- and vehicle-dependency. Solubilization is the rate-limiting step in percutaneous absorption of AZA. Just how does Finacea work ?